An American treasure, Maya Angelou, is being honored by the U.S. Postal Service with a Forever stamp. Author, poet, actress, and champion of civil rights Dr. Maya Angelou (1928-2014) was one of the most dynamic voices in all of 20th-century American literature. The book I Know Why the Caged Bird Sings, an autobiographical account of her childhood, gained wide acclaim for its vivid depiction of African-American life in the South. The stamp showcases artist Ross Rossin’s 2013 portrait of Dr. Angelou. An oil-on-canvas painting that is part of the Smithsonian National Portrait Gallery’s collection. 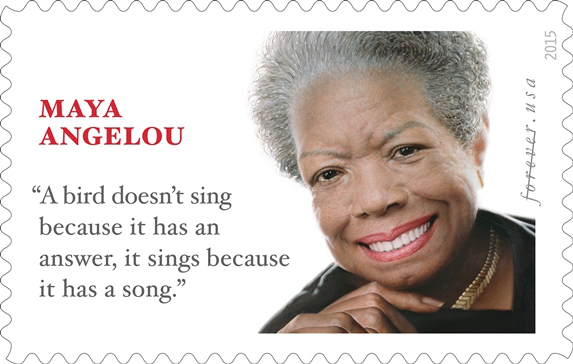 The Maya Angelou Forever Stamp is available for preorder here to be delivered after April 7. In the meantime, the USPS is encouraging customers to tweet out #MayaForever to spread the word about the stamp.